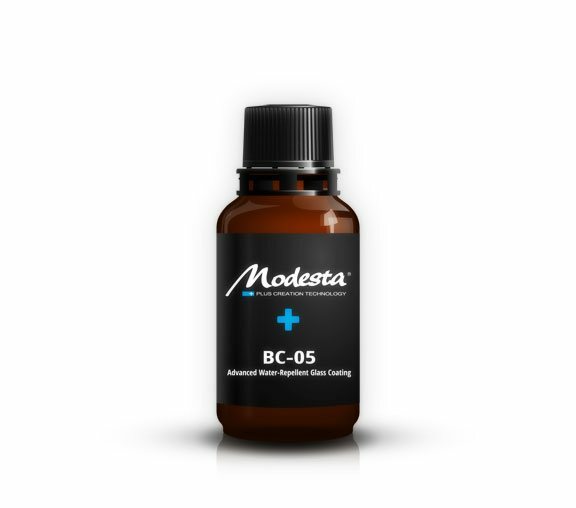 Modesta BC-05 is a unique glass coating based on a three-dimensional molecular frame. It forms a highly durable clear hard glass layer on automotive paints. BC-05 produces a deep shine and helps to protect the paint from all kinds of damage including wash-induced damages, scratches, oxidation, sap, watermarks, salts, acids and even permanent ink and paints. It's strong water-repellent properties also promote the self-cleaning effects. Used stand-alone as a sealant, BC-05 produces an unique kind of gloss called the "candy-like" gloss. If combined with the P-01A primer this effect is even deeper as the layers of both products are combined to a single coat. The coating also reduces drag by 5 km/h compared to regular paint at speeds over 60 km/h (drag coefficient: -0.02). It can be applied even to the most advanced and sophisticated paints, such as Nissan Scratch Shield, Lexus' self-restoring coat and Mercedes ceramic paint.